US 411 Connector: The purpose of the proposed US 411 Connector is to provide a direct connection between US 411, at its interchange with US 41 west of Cartersville, and I-75, to relieve congestion along the existing US 411 to I-75 corridor. Cost: The Georgia Department of Transportation (GDOT) selected a design (Route D-VE) that will cost taxpayers more than $214 million, which is $112 million more than the originally proposed route. In addition, Route D-VE will require the destruction of Dobbins Mountain (peak elevation over 1,150 ft) and will require an atypical jughandle interchange with traffic lights, which raises concerns about safety and congestion. Route D-VE will require 13 expensive bridges and overpasses. Other viable options considered for the connector follow the area’s natural topography and would require significantly fewer structures. The enormous cost of permitting and constructing so many overpasses will ultimately impact funding for other important state road projects. Additionally, in its present estimate for Route D-VE, GDOT is using a statewide, “common excavation” average cost (per cubic yard) that it has developed for the “typical” state road project. Route D-VE will require significant excavation work (removal of approximately 5.1 million cubic yards of earth and rock), blasting through Dobbins Mountain, intensive hauling and sophisticated engineering. The excavation cost average for constructing Route D-VE through hilly/mountainous topography would cost substantially more than for a road project in Georgia’s flatlands, but GDOT has not yet taken that extra cost into account. Distance: Route D-VE is 2.5 miles longer than some of the other routes considered for this project. As proposed, the route would not provide convenient or “free-flowing” access to SR 20 east for northbound traffic on I-75, and would not provide convenient or “free-flowing” access to I-75 northbound for eastbound drivers on the 411 Connector. Also, stop lights would impede traffic flow. Environmental impact: GDOT’s proposed Route D-VE will negatively impact the Pettit and Nancy Creek watersheds, which are home to threatened and federally protected fish species, and will negatively impact the pristine Dobbins Mountain ecosystem. In its October 2005 U.S. 411 Connector newsletter, GDOT reported that the Pettit and Nancy Creek watersheds are “sensitive environmental resources” that would be crossed by the proposed route. Stream evaluations for both watersheds indicate that the ecosystems as they now exist are already fragile. Both watersheds are facing high conductance and pH levels, and evidence of bank erosion was noted in dozens of locations. Route D-VE would require several crossings of Pettit Creek, and the substantial increase in impervious surface (i.e. asphalt or concrete) would further jeopardize the threatened and federally-protected Cherokee darter. This is one reason the U.S. Fish and Wildlife Service has voiced concern over the proposed route and the negative impact it will have on threatened species. In addition, the full potential environmental impact of Route D-VE has not been studied. GDOT originally estimated the route would directly impact 3,247 linear feet of streams (an estimate that the agency subsequently lowered) and did not mention three additional streams that have not been studied but that will be impacted. The three streams total an additional 1,010 linear feet. As a result of these omissions, the “Final Supplemental Environmental Statement” substantially underestimates the impact of the connector to state and federal jurisdictional waters. Also, GDOT will have to blast – at several points – through a Bartow County landmark, Dobbins Mountain. The destruction of the mountain will adversely impact and displace wildlife and will introduce acid drainage of minerals into local waterways, which could prove deadly for the darter and other aquatic organisms. 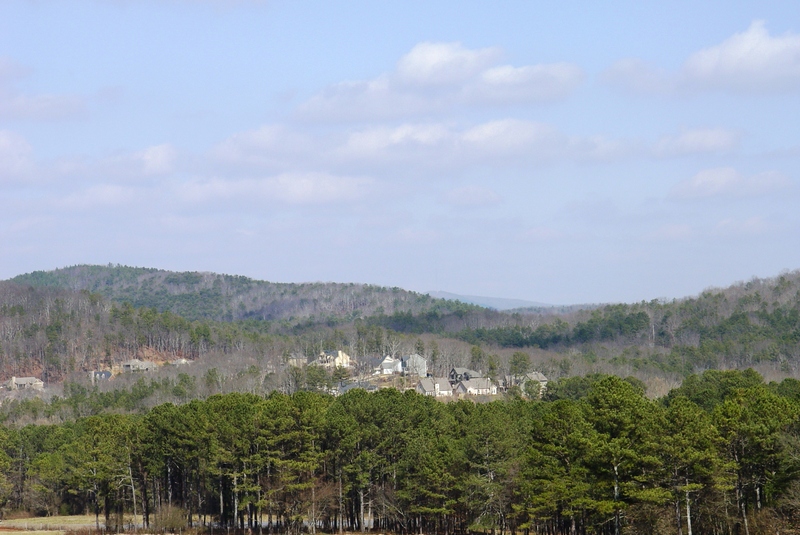 Last summer, the City of Euharlee, Georgia, became the holder of a conservation easement of approximately 107 acres of contiguous hardwood forest at Dobbins Mountain. The easement provides habitat for migratory birds and other wildlife. Additionally, bald eagles and panthers have been observed at this location. In recognition of this wildlife habitat, the city designated the easement property as a significant wildlife refuge. The wildlife refuge is directly in the path of Route D-VE, but can be preserved if an alternate route is chosen. Time to construct: The construction period for GDOT’s proposed Route D-VE will be considerably longer than some of the other routes that could be used for this project. It will require the blasting of Dobbins Mountain and the prolonged construction of 13 costly bridges and overpasses. Unknown subsurface conditions in this difficult geology could result in additional construction and significant project delays. Historical/cultural resources: Route D-VE would bisect the site of Dobbins Mine, which should be eligible for the National Register of Historic Places under guidelines published by the U.S. Department of the Interior. Dobbins Mine has been in existence since at least 1867 and is recognized as the oldest and most productive manganese mine in Georgia. Field studies have identified 43 earthen features at Dobbins Mine which are at least 60 years old and are the result of historic manganese mining. Twenty of these features are located within the proposed Route D-VE right-of-way and would be destroyed if the road is built. Consultants that conducted a 2005 archeological survey for the proposed 411 Connector acknowledged that “the true extent of the (Dobbins Mine) site was not investigated.” Based on these concerns, the State Historic Preservation Officer has directed GDOT to conduct historic mining studies and to re-evaluate the eligibility of Dobbins Mine for the National Register. The re-evaluation of the mine is ongoing. Environmental justice: Route D-VE raises considerable environmental justice issues because it encroaches upon several historic communities and places of worship. For example, GDOT’s route will pass near the Peeple’s Valley Church and Mays Family Cemetery, as well as the Church at Liberty Square, Christian Fellowship Church and Pine Grove African Methodist Episcopal Church (which dates to the 1800’s). Also, Route D-VE will increase noise levels in surrounding communities and diminish the churches’ land values and solitude. Cost: Other feasible options provide shorter and more efficient access to I-75, and would cost many millions of dollars less – a benefit to taxpayers. There are viable alternatives for the 411 Connector that require little new right-of-way for the I-75 interchange. Several alternate routes minimize major railroad and roadway crossings, and provide an end point that could not be used as a reason to restart the highly controversial Northern Arc. (Many have expressed concern that GDOT’s current route for the connector only makes sense if GDOT is attempting to build the first section of the Northern Arc). Distance: Other routes are more than two miles shorter than GDOT’s proposed Route D-VE and would provide more convenient access to I-75. Unlike Route D-VE, there are alternative routes that run along industrial corridors and thus limit impacts on neighborhoods. Positioning the route along industrial routes rather than residential pathways will accommodate industrial growth in the county without infringing on as many private residences as Route D-VE. Traffic Delays & Safety: Studies by experts indicate that the “atypical” interchange GDOT plans for Route D-VE at I-75 may well increase congestion and traffic jams on I-75, thus increasing overall travel time. Traffic will not flow freely from the connector onto I-75 or vice versa; rather, traffic will have to pass through (and likely stop at) two to three traffic signals. In particular, traffic proceeding southbound on the connector to I-75 will be forced to pass through (and likely stop at) a traffic signal. Northbound traffic wishing to exit I-75 to join U.S. 411 to Rome will have to weave through a wall of trucks to negotiate a tight-radius “jughandle” exit loop that will require a rapid decrease in speed to avoid accidents (roll overs). This same traffic will then have to pass through (and likely stop at) a traffic signal. By comparison, the alternative route would permit an interchange to allow seamless entrance and exit from I-75 while keeping up speed. No traffic signals would be necessary and traffic congestion and accidents would be avoided. Time to construct: Most of the other routes considered for the connector can be completed on a significantly shorter timeline than Route D-VE. Quite simply, a shorter road means less time for construction, and in this case, GDOT will not have to blast through extreme topography or construct as many bridges and overpasses for a longer road. Environmental justice: Better alternatives to Route D-VE have been studied, which would impact fewer historic communities and new residential subdivisions, and would not encroach upon places of worship in the community. Historical/cultural resources: Other possible routes for the connector, unlike Route D-VE, would leave the historical, environmental and cultural resources at Dobbins Mine completely undisturbed and intact – preserving an important part of the Bartow/Cartersville region’s identity and history. Civil Litigation Against GDOT: In 1991, a civil lawsuit was filed against the Commissioner of GDOT, the U.S. Department of Transportation and the Federal Highway Administration (FHWA), claiming that development of the U.S. 411 Connector failed to comply with the National Environmental Policy Act (NEPA) and applicable regulations. The plaintiffs also requested the court prevent any further work on the highway until GDOT et al. complied with NEPA and the Federal Highway Act. In 1993, Federal Judge Robert L. Vining, Jr. ruled against GDOT et al. for several reasons. Judge Vining specifically found that the property is “endowed with natural beauty, natural resources, recreational value, and [is protected] from encroachment of surrounding industrial and transportation facilities.” Judge Vining also found that GDOT did not follow federal law requiring “a good faith, objective, hard look at the environmental consequences of the alternate routes,” and that the chosen route “would result in the destruction of the [Rollins] property.” GDOT was ordered not to spend any federal funds on the connector until an adequate and proper Environmental Impact Statement (EIS) was prepared. The court stated the EIS should have contained a detailed discussion of GDOT’s originally-chosen Ridge Route (which is very similar to today’s Route G). Without a detailed discussion of that alternative, there was no basis for the public or the decision maker to balance and compare the alternatives. It is apparent that, if GDOT proceeds on its present course, there will be another lawsuit based on the state’s actions, with all its attendant delay and expense. This would not be necessary if GDOT were to proceed to build the right road for residents that is cheaper, more efficient and preserved environmental and historic resources.